Last year, I contacted Reac Japan (the company that makes the Design Interior Collection Chairs) to ask when they would be releasing a new set of chairs. The company responded promptly to tell me that they did not have any immediate plans to make additional chairs. I had hoped that this would change but have not seen any new releases from them. I guess the 5 standard sets, single limited set and three specials are all that will be. I'd be a liar if I said I wasn't disappointed. I had hoped their miniature offerings would have branched out to designer tables/desks, storage units, and even kitchen and bathroom sets like those pictured below. Wouldn't that have been great? Could you imagine how wonderful it would be if they released more furniture? Ooh, or lamps? That would be super... and, of course, a tulip table, because I'm obviously never, ever finding one on EBAY! I received 4 blind boxes of the Reac vol. 4 set as a gift and two of my chairs were the same; I have two of the no. 2 chairs, the Le Corbusier lounger. Does anyone know of a place in Chicago where I can trade? Im an architecture student & im looking for the Eames lounge & ottoman for a project. 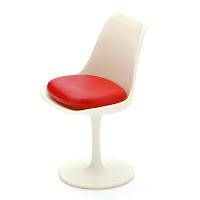 I am designing a studio using the form of the chair for inspiration & I would love to have a mini set to put in my model. Where can I get it? They seem to be so hard to find individually. Does any one have doubles? You can find them sold individually on ebay and via Elf Miniatures online store. Some Etsy folks sell them too. AH!I can't stand it everything is just so cute! I was on the hunt for some re-ment that I saw some months back when I came apon the reac pieces. Man I wish I knew about these when I was in school studying interior design! These are awesome! Thank you for the wonderful blog site and link resources.